More often than not, job descriptions are as vague and frustrating as the end of The Matrix-leaving you with more questions than answers. What does "willing to be flexible" really mean? 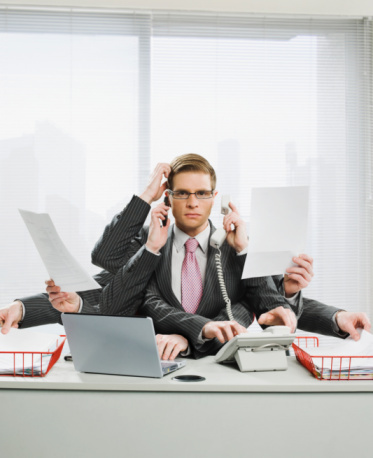 What does the day of a "master multi-tasker" actually entail? And what are you getting yourself into in a "fast-paced, high-intensity" environment? Sometimes, these phrases are harmless, but others, well, let's just say it pays to read between the lines a little bit. We chatted with a recruitment consultant from a Toronto-based executive search firm and got the skinny on what these cryptic bullet points may really mean. Read on for a quick translation guide-plus what you should ask during an interview to make sure you uncover any major red flags. "flexible and willing to perform other tasks as assigned." This line signals a job that will give you a variety of job duties, which can be great if you're the kind of person who thrives on every day feeling a little bit different. Just beware that "other tasks" might not always be lending a hand to another department-it could mean compiling reports or even picking up the dry cleaning. This one-liner is often in place to help cover the company's behind when miscellaneous duties get tossed your way. Make Sure to Ask: "In addition to the responsibilities in the job description, what kinds of other tasks might the position entail?" We all want a job that keeps us busy and lets us build our skill set quickly, right? Lines like "fast-paced" and "work hard, play hard" often signal a busy, challenging, and exciting work environment. At the same time, though, you want to make sure you're not headed for a pedal-to-the-metal kind of place with the dreaded whiplash of high stress. Yes, you should work hard-but you also want to make sure your definition of "working hard" aligns with the company's. Make Sure to Ask: "Can you walk me through what a typical work day looks like? What hours do most people spend in the office?" "highly organized with great attention to detail." This phrase is often seen in project management positions or roles that require or a lot of number-crunching. While you don't need to be a nit-picking fusspot in life, the company is definitely looking for an on-the-job perfectionist-someone who notices the little things and doesn't mind double- and triple-checking her work. Before signing on the dotted line, make sure you're really as meticulous as you say you are if you're going to set yourself up for success. Make Sure to Ask: "In terms of staying organized, what kinds of software and systems does someone in this role use?" On the bright side, this phrase indicates a tall structure where you may have the chance to climb up the ladder within a multi-level company. On the other end of the spectrum, start-up companies who are tight on money may use this phrase loosely, offering it as a consolation prize for their shoestring budget. Your job is to tease apart the difference between "we have a big role we want you to grow into" and "we have a big gap between where we know you should be and what we're offering you." Make Sure to Ask: "I'm really looking to grow with a company-can you illustrate the potential for growth in this role?" "high achiever, driven to succeed." Calling all ambitious types! This job description phrase is often found in recruiting or sales role, and means that if you're a natural talent with an appetite for success, you'll likely have the opportunity to bring home a lot of extra bacon. Just keep in mind that these types of environments often expect their employees to go above and beyond the call of duty-read: putting in long hours while sometimes spending personal resources and, at worst, eliminating any semblance of a work-life balance. Make Sure to Ask: "What does a typical week look like for the people who are most successful in this role?" "self-starter and able to work independently." On one hand, this line guarantees autonomy, which is a dream for anyone who avoids micromanaging bosses like the plague. It's also an opportunity to take ownership of projects or even run the show as you see fit. In the same vein, you'll be expected to solve your own problems, and this may be due to lack of resources and money for proper training programs. You do want to make sure you're not getting into a situation where you'll always have to fend for yourself. Make Sure to Ask: "I'm great at working independently, but if I run into any problems, who would my team be? What sorts of resources will I have?" Ultimately, you'll find these bullet points in all sorts of job descriptions-in both great, exciting jobs, and in jobs where they're signalling some red flags. So, do your homework. Remember that interviews are a two-way street, and an opportunity for you to make sure you're a good fit for the work environment. By asking the right questions and sniffing out the warning signs, you'll be on your way to finding your dream job.